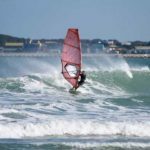 This year’s 2018 X Wave wave boards (75L to 130L) have been design for total control, earlier planning and fast top end speed. Design to be used in onshore waves, smaller DTL wavesailing and flat water blasting. Small design refinements to the 2018 range include a flat to veed, double tailed concave married to our fast wave board rocker line. Rail fullness and apex have been slightly increased in the nose area to hide more volume and reduce the chances of front rail catch at speed. Available in Single Fin , Tri fin and Foil options. Front fin boxes have US or Slot box options with the back fins US , Power box or deep Tuttle box for foiling, options.